I had hoped that Jason Reitman would steer his new political satire in the direction of “Wag the Dog” or “Primary Colors.” Surprisingly it’s closer to last years “The Post” (with quite a few scenes at Washington Post), and that’s a problem. “The Front Runner” (already taking flack for being “anything but”) is an exhaustively talkative movie that ironically doesn’t have much to say. It should have been a film that ignited conversation due to it’s relevancy It might also disappoint you that Hugh Jackman doesn’t have the kind of screen time you would expect. It’s an ensemble of off-marquee names getting the bulk of scenes. Reitman’s first film of 2018, “Tully,” is a much more praiseworthy accomplishment. Colorado senator Gary Hart (Jackman) was the future of the Democratic party. With his sights set on becoming the presidential nominee for 1988, he starts a campaign that receives impressive support across the country. Campaign manager Bill Dixon (J.K. Simmons) said Hart’s gift was his ability to explain politics and issues to voters. The ’24-hour news cycle,’ a new thing in the late 80s, created a demand for more personal details about candidates. Hart had a problem with that. Hart also had a problem keeping his pants zipped and a story about his infidelity threatened to ruin him personally and politically. “All I ever asked was that you don’t embarrass me,” his wife Lee (Vera Farmiga) says in disappointment. Reitman juggles many different ideas in “The Front Runner” and nothing stands out. At some point, the public is going to turn on Reitman for these mediocre films that always stop short of reaching their full potential. How does a four-time nominated writer/director (“Juno,” “Up in the Air”) get it so very right on some and totally miss the mark on others? Early on in the film recent Oscar winner JK Simmons (“Whiplash”) gets some humorous jabs in that offer hope that his character might save the film. His very direct, potty mouth role is quickly sidelined though and lost in the script, which mirrors what happens to most characters in “Front Runner”. Reitman juggles with so many different ideas in “The Front Runner,” and nothing stands out. Reporters trying to fulfill their duties as the Fourth Estate even when it involves invasion of privacy. While on the other side is Hart and his family, what amount of privacy should you expect when you’re a public figure? Reitman can’t find a way to balance the two narratives leaving the audience to watch events play out, but never get invested in either. Jackman’s (“The Greatest Showman”) talent is poorly utilized here and maybe he was just the wrong actor for this role. He gets a few shouting match scenes that feel like Oscar clips that will never be used. We have already seen stories like this told from the journalist perspective. It might have been a more unique story if told from the wife’s or the campaign manager’s perspective. Both Farmiga and Simmons are completely wasted on a script that is unable to effectively use their talent. “The Front Runner” fails because the audience can’t find sympathy for a guy that’s so adversarial and naïve, and maybe a little bit because who wants to pay to see the same type of stuff that’s in the news on a daily basis. Sometimes saying so many different things in one movie, means the audience isn’t hearing anything at all. 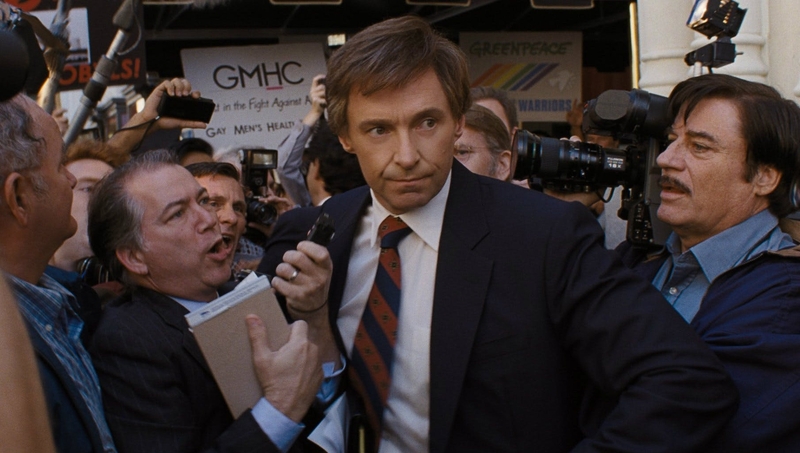 Reitman misses the mark in this bland political satire with a miscast Jackman and an underutilized cast. Most of Reitman’s films, as you may know, are usually satirical in nature, as this one is. The facts of this “movie review” are the facts from the movie. This review is simply my opinion on a film that didn’t turn out as well as it could.